New ties will soon be forged where railroad ties once joined the steel tracks of a Union Pacific Railroad line that connected rural South Texas to the rest of the country. 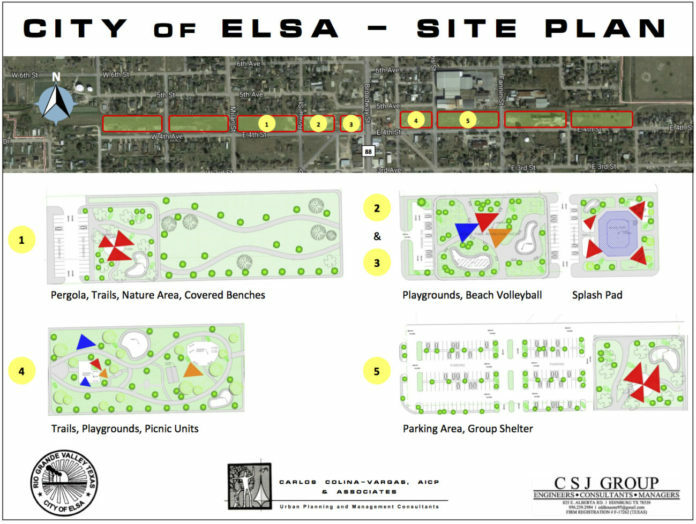 It’s happening in the city of Elsa, which was recently awarded three grants to construct a municipal park at the site of the abandoned Union Pacific Railroad property. It’s a place that divides the city in two, Elsa City Manager Juan Jose “J.J.” Ybarra said last Wednesday. “You could literally get from one side of Elsa to the other with this walking trail,” he said of one of the many amenities planned for the park. According to a statement released by Rep. Terry Canales, D-Edinburg, the park will be located on approximately 22 linear acres of the former railroad property, and will stretch some 1.4 miles from Hidalgo Street on the west side of the city to the east, adjacent to Edcouch-Elsa ISD’s high school and middle school campuses. Elsa, via its Economic Development Corporation (EDC), purchased the park for just over $280,500 about two years ago, Ybarra said. The city then enlisted the help of a grant writer from Carlos Colina-Vargas, AICP & Associates of Austin to help secure funding for the project. Those efforts proved successful, as Canales’ office announced the award of a $500,000 grant from the Texas Parks and Wildlife Commission. Ybarra said the Valley Baptist Legacy Foundation, an early supporter of the project, awarded Elsa an additional $500,000. “Then we have some in-kind contributions from Commissioner David Fuentes, Precinct 1. And then we have, of course, city allotments from CDBG, which is like an urban county program,” Ybarra said. “It will, no doubt, become a major attraction and contributor to the local economy and shall also serve as a physical wellness service program to the residents of City of Elsa (sic) and Hidalgo County,” Fuentes wrote in a Nov. 20, 2018 letter of support addressed to the Hidalgo County MPO. In the letter, Fuentes also pledged to provide $75,000 worth of in-kind contributions by making his staff and the use of heavy equipment available for the park project. The MPO ultimately agreed to help fund the project. “We’re looking at $1.8 (million) is where we’re at,” Ybarra said of the final tally of funds available for the park — a project he said the city could not pursue without outside funds. “Without funding from those entities, yeah, it definitely would not be possible for us. We just couldn’t carry that,” he said. The park is an integral component of an ambitious effort by the city to transform its landscape. It began with the creation of a parks master plan, Ybarra said. City leaders then turned their attention to acquiring the abandoned railroad rights-of-way for the park, which will include the aforementioned walking trail, a skate park, a splash pad, inclusive play equipment, two beach volleyball courts, and more. The park will be accessible to people with disabilities. It will also make use of cutting-edge public infrastructure building materials, including shelter stations, benches, picnic areas, and shade and rest stations made with recycled materials. It will also feature shelters that will capture rainwater, solar-powered lights and water fountains, and energy efficient electrical fixtures, according to the statement released by Canales’ office. “Hopefully, it’s going to be one of those parks that kind of changes the landscape of the city, as well, which is what we’re trying to do here,” Ybarra said.